"We absolutely love Dr. Kupersmith and the staff at Animal & Bird Care Center and Hospital! Everyone is always so nice and friendly and they all truly care about each and every one of their clients and their pets." Dr. David Kupersmith is a 1989 graduate of the College of Veterinary Medicine at the University of Minnesota and joined the Animal & Bird Health Care Center in 1992. A partner in the practice, Dr. David Kupersmith was previously a lecturer for the Pet Industry Joint Advisory Council and speaks at national trade shows for the pet industry. He has also written a column for a ferret magazine, and recently hosted and lectured at an Oxbow Pet Product seminar on Small Mammal Medicine that was attended by over 60 veterinarians from the Delaware Valley and beyond. Dr. Kupersmith has answered viewers questions on a CBS3 Ask-The-Vet phone bank and speaks at many local organizations. ​Dr. David Kupersmith is a member of many national organizations including the Association of Exotic Mammal Veterinarians and the Association of Avian Veterinarians. He currently serves on the Board of Trustees of Woodford Cedar Run Wildlife. When not practicing veterinary medicine, Dr. David Kupersmith enjoys world cuisine cooking and dining. 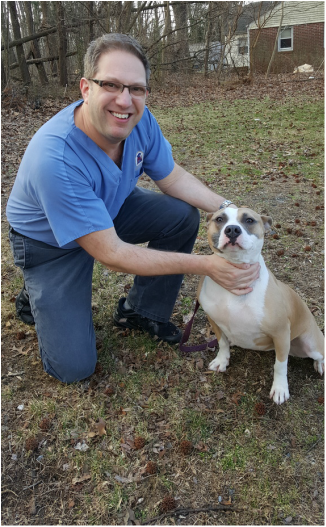 He lives in the Cherry Hill area with his rescue dog, Oriana, a pit bull mix.